Susan Willshee on Win a copy of Dolphin Kick on DVD – two to be won! Sally Collingwood on Win a copy of Dolphin Kick on DVD – two to be won! I was thinking the other day about what the worst job of parenting (so far) has been for me. There really was no contest. Hands down, the worst job so far has been the 3 times a day process of cleaning a highchair. Now with four children this has so far consumed approximately four years of my life and I probably have another two years to go on top of that. Now granted some highchairs are worse than others and the easiest to clean has to be the bog standard IKEA highchair we now use for our toddler. It’s the one that you see in soft play centres and restaurants and it is great for children from around 12 months plus. The other highchair we have is the Fisher Price Rainforest Highchair. Now the thing I love about this is the fact it can be used from birth. This means that the babies have been able to sit up at the table with the rest of the family at meal times. This has been a real bonus. However, once the process of solids begins this lovely, practical highchair takes on a different persona. It becomes a food-invested, food-stained, smelly, grubby mess and it is the one job as a parent I truly loathe! Despite a good scrub, even a hoover three times a day and putting the straps into the washing machine once a week it still never quite looks good enough somehow. Now to outside eyes I am assured it looks fine but I know where things hide and how it looks on a bad day. As I am about to begin weaning again and as I still also have the toddler highchair to clean three times per day I’ve been stocking up on cleaning essentials. I do worry about what I spray on the highchairs and clean the tray tables with. Part of the tray can go in the dishwasher which I find to be a bonus, but the products I favour are from the Milton range. I normally take the worst off the trays and floor with a Milton wipe or two…or three, or four, depending on how bad things are looking! Then I use kitchen roll and the Milton spray to get things nice and clean and smelling nice again. My absolute favourite thing about this spray is the smell – everything just smells yummy afterwards. Even though it smells great it is cleaning, disinfecting and freshening all in one go, so just because it smells nice doesn’t mean it isn’t effective. The Milton hand gel is a great addition to make sure my hands are nice and clean afterwards and I also keep some of this in the car and change bag. 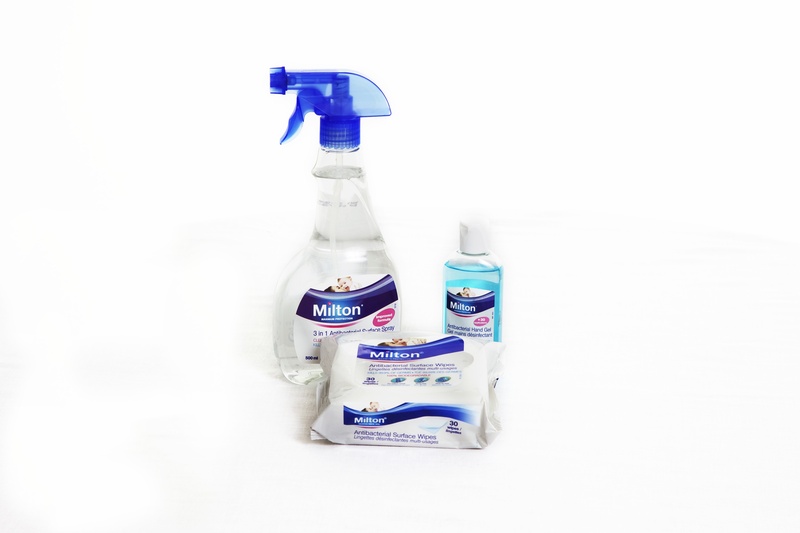 Milton wipes and the spray are also really great for cleaning toys, change tables, potties and so on and of course cleaning up the dreaded sick! Cleaning the highchair might be my pet hate but I trust Milton and these products make life much easier! What is your most hated parental task? Oh yes I can relate. i bought a nappy system for number one as I thought it was a good idea. Now they go straight outside to the main bin, much better. Thanks for reading! You are right! Thanks for reading! Oh yuk, I hated cleaning the high chair!!! It never seemed clean however much I wiped! Oh I know it's the worst. Thanks for reading!